CloudFone has been in the mobile industry for quite some time and they are known for releasing monstrous battery capacity mobile phones, but unfortunately, CloudFone Thrill 450Q has only 1800mAh which is not good enough for a quad core smartphone, didn't mean to let you down cause CloudFone Thrill 450Q has some few surprise on its build and features. Presenting One-Glass-Solution touch screen sensor technology! One-Glass-Solution (OGS) touch screen sensor technology. One-Glass-Solution touch panel uses a single piece of glass as both cover lens and sensor substrate, its integrates the touch sensor into the cover lens in order to reduce the material cost, thickness and weight of the device. 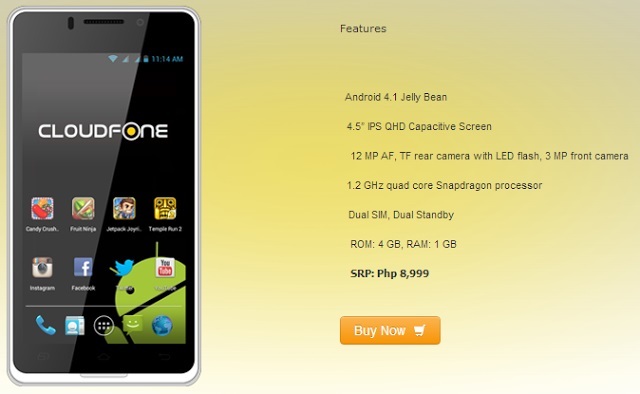 CloudFone Thrill 450Q at Php8,999 SRP |Available now in the Philippines nationwide. I'm a light to moderate user, its been a week since i bought this phone and i'm satisfied with the performance. also design is good. ito din ba yung nsa globe postpaid plan?